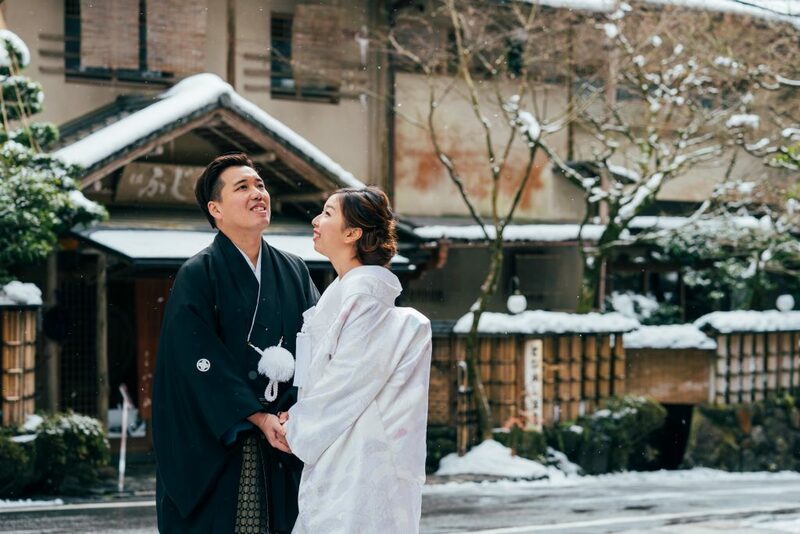 E & A approached us more than a year from their wedding date to plan for their destination wedding in Japan – Japan held a special meaning for the both of them, and the bride had always dreamed of holding a beautiful snow wedding there. 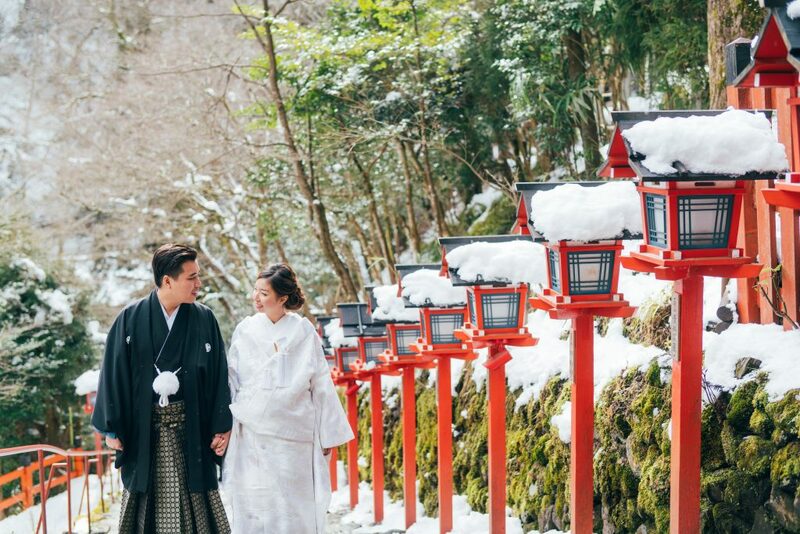 They were both extremely open to options and ideas, but their only requirement for the wedding was snow, and later on accessibility for the guests attending the ceremony. 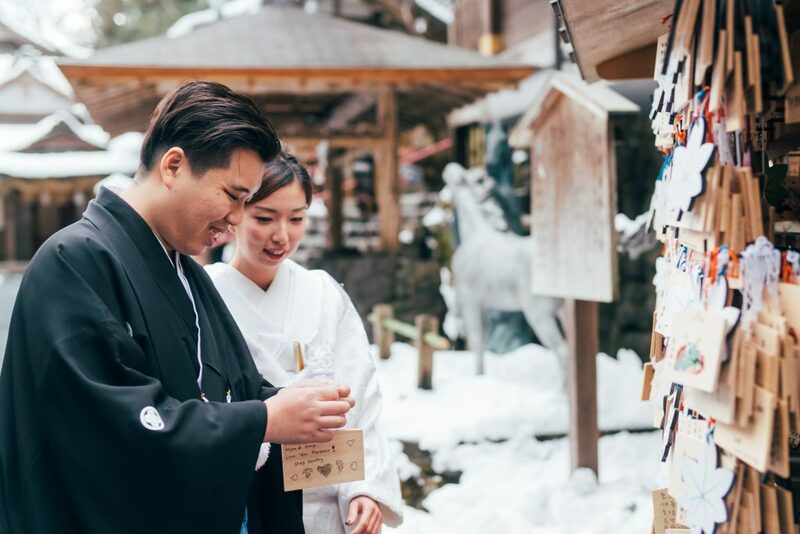 With that in mind, we started searching and shortlisting shrines within areas that are more likely to snow and the couple finally settled on Kifune Jinja, which is within a picturesque small town nestled in one of the northern mountains in Kyoto. 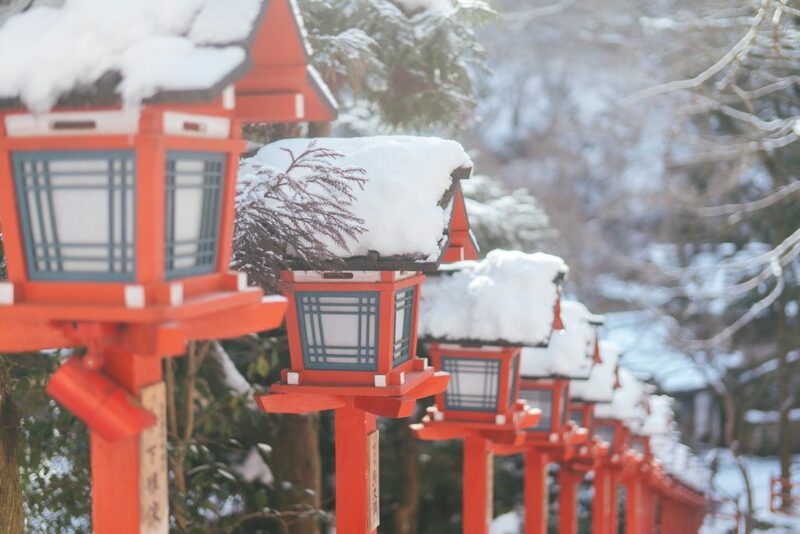 The snow scene is Kyoto is pretty rare but undoubtedly beautiful. 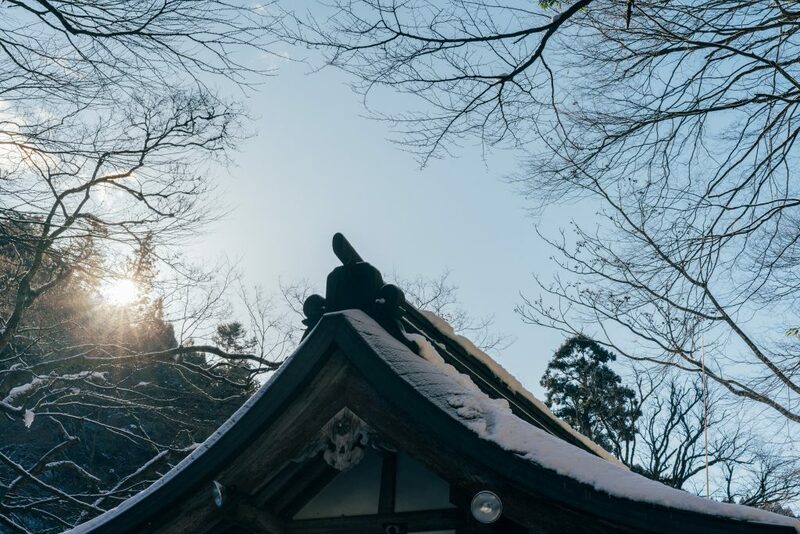 Japan experienced one of the coldest winter earlier this year, which got even the cities in Osaka and Kyoto covered in snow – we thought we were in luck! 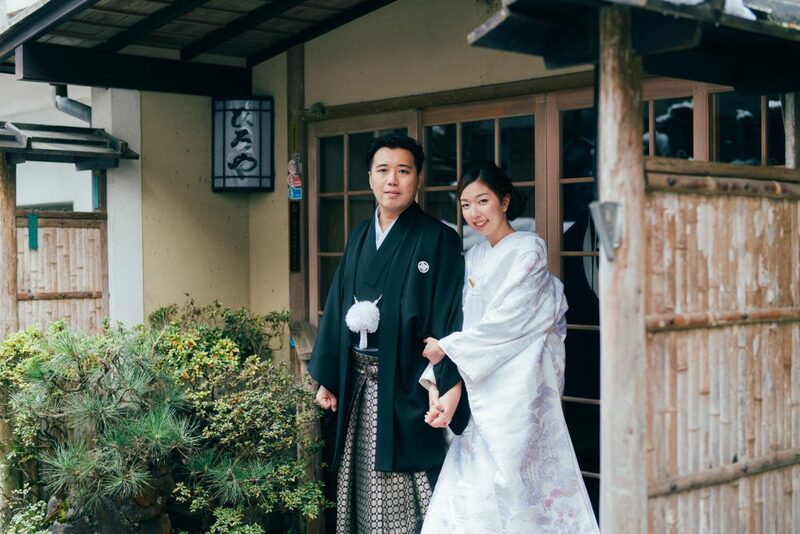 Set off at 8am on the day and picked up the couple at their hotel near Kyoto Station. 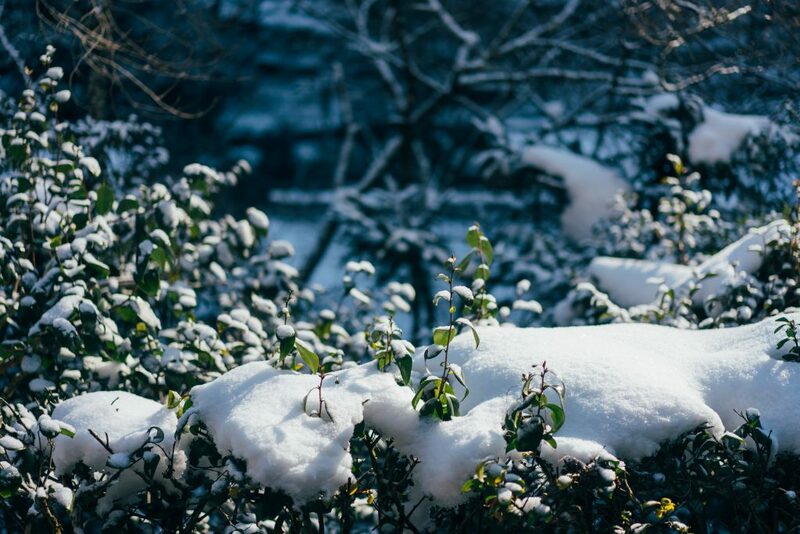 We were all a little worried in the morning as the snow had stopped for 2-3 days, and there were no traces of snow left in main city of Kyoto. 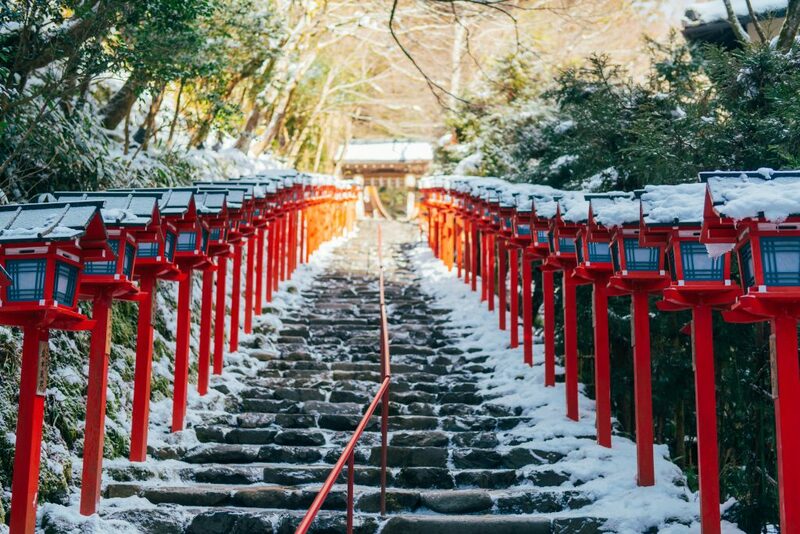 After about an hour drive, we were finally arriving at Kibune town, and were greeted with a beautiful frost trail covered with snow. 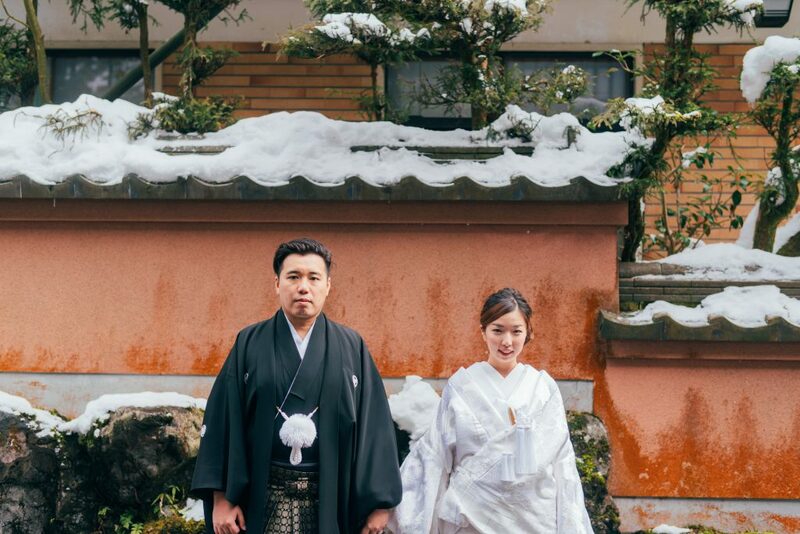 A tip for couples doing a snow wedding, do prepare and bring along heat packs with you! 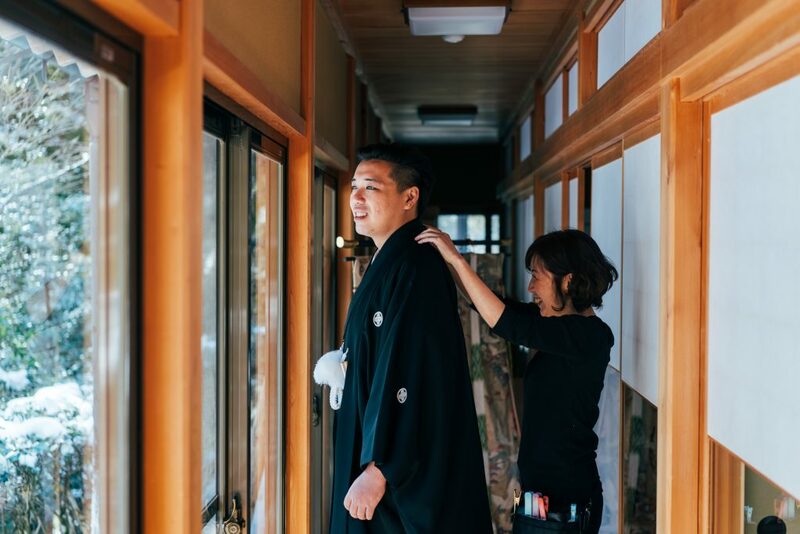 Especially for the groom if you are wearing the traditional Japanese outfits as the layers are thin. 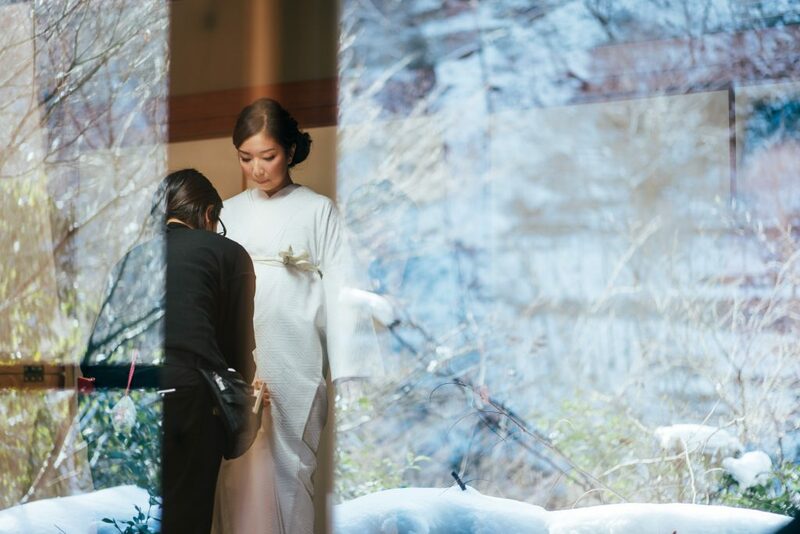 Upon arrival, the bride started her makeup while the groom and the rest of the guests explored the area. 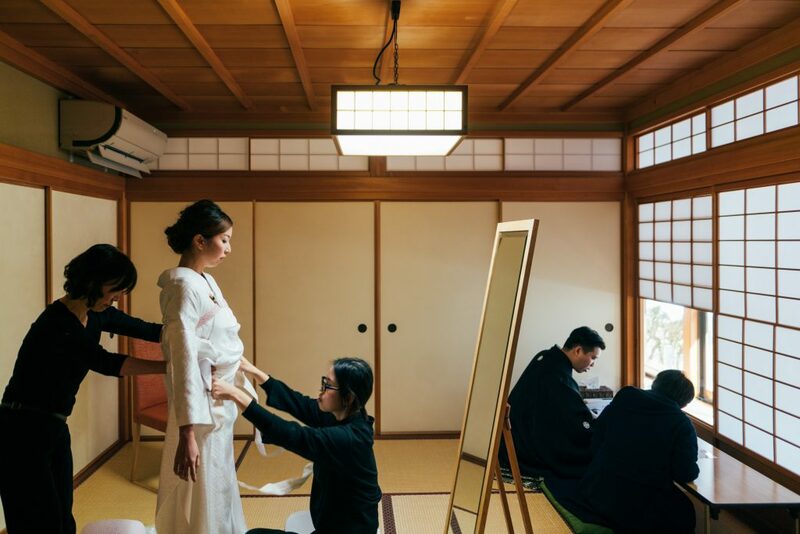 The shrine comes with a changing room for makeup and preparations for the convenience of the wedding couples. 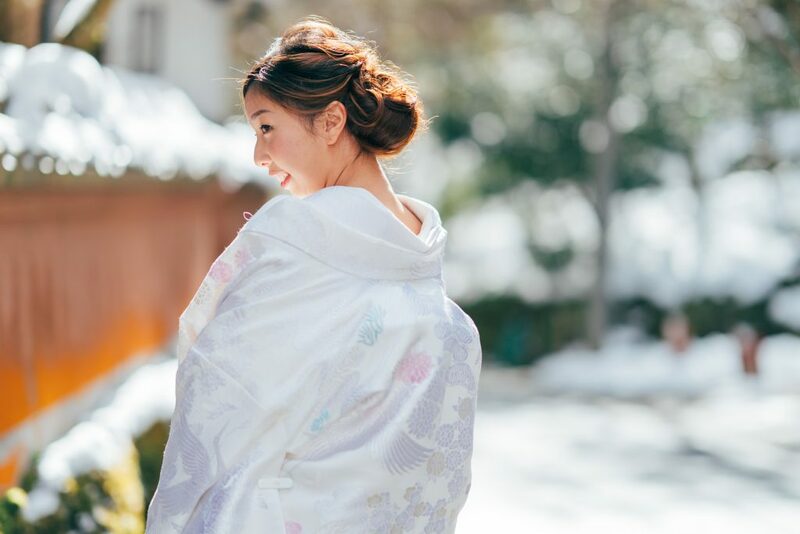 The bride chose to wear a pure white Shiromuku kimono, with floral and crane embroidery with a slight sheen. 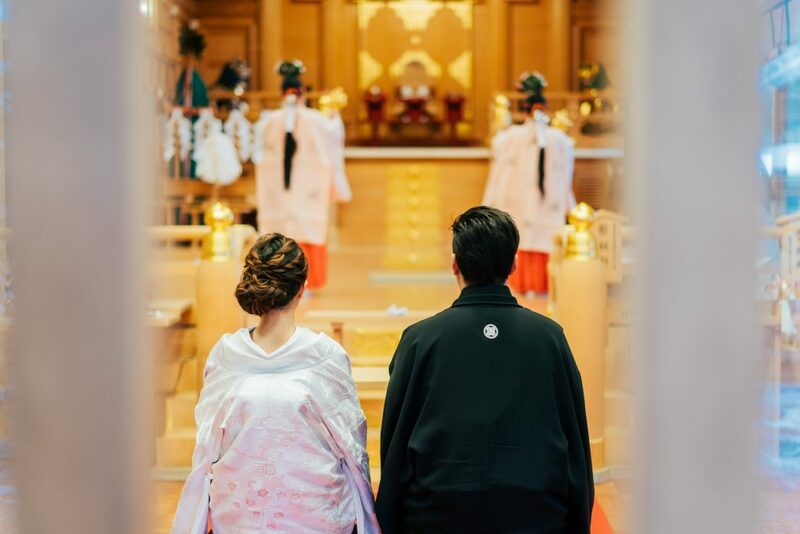 The wedding couple will usually receive a set of the printed wedding vows in Japanese, which requires them to sign on it, and recited by the groom during the Shinto Ceremony. 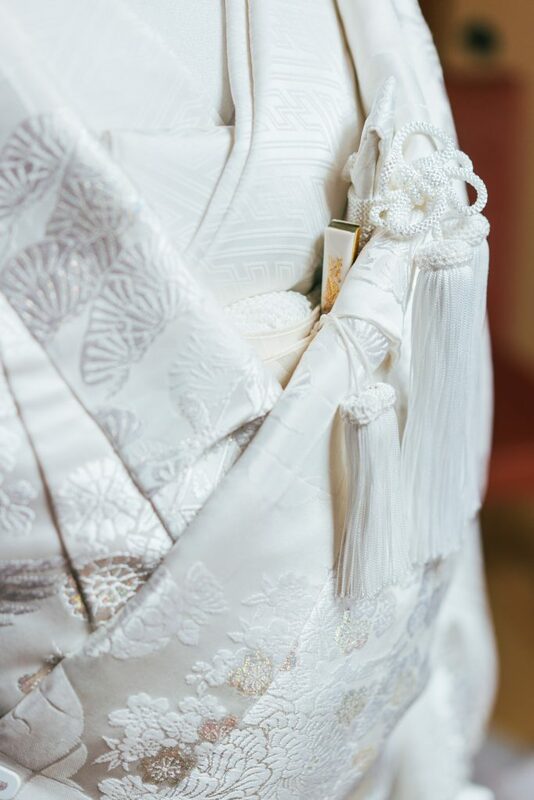 This will then be given back to the couple for keepsake after the ceremony. 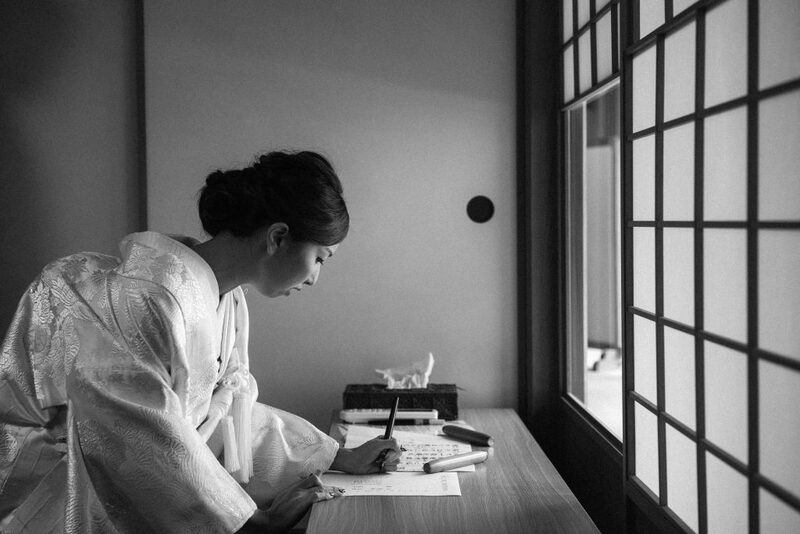 Catered for about 45 minutes before the ceremony to take some photos around the beautiful surroundings. 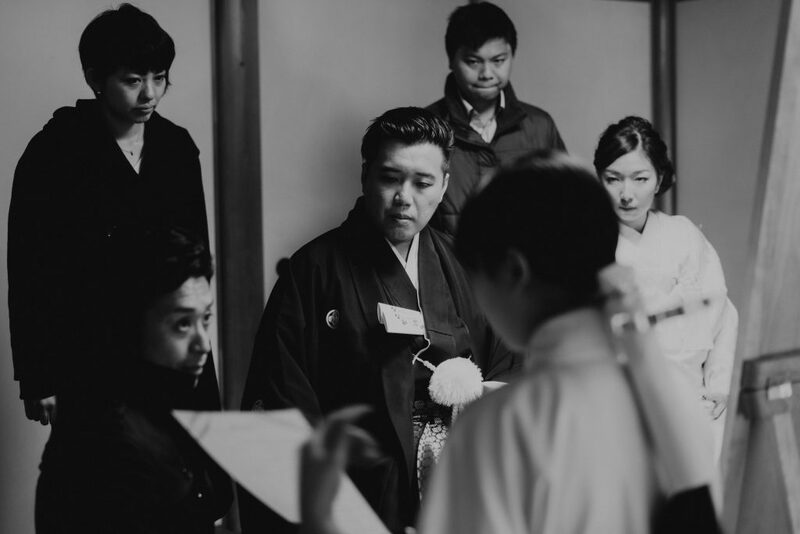 A quick briefing for the couple and guests before the ceremony. 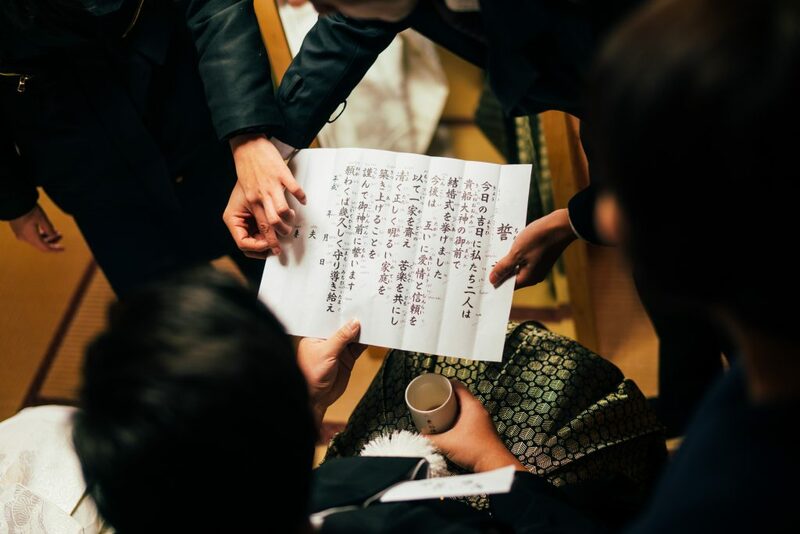 And a final practice of the wedding vows for the groom, whom did a great job reciting the vows in Japanese during the ceremony! 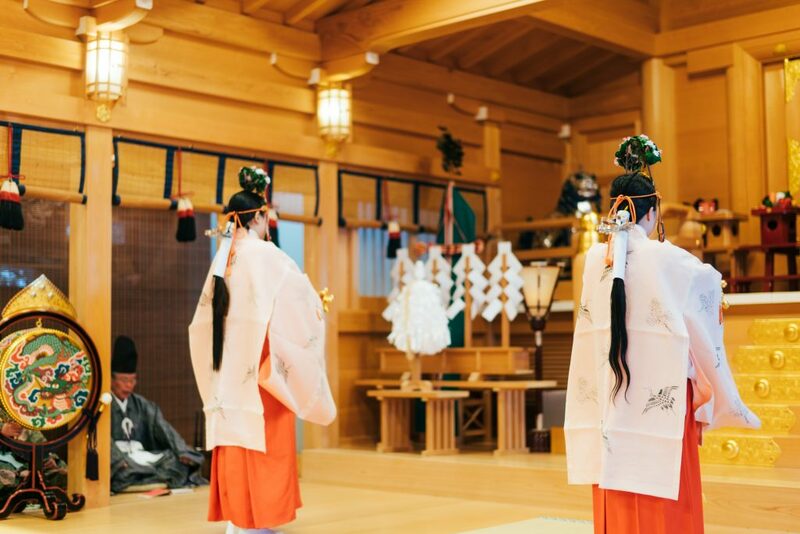 After 3 hours of preparation and phototaking, we’re all ready to start the ceremony. 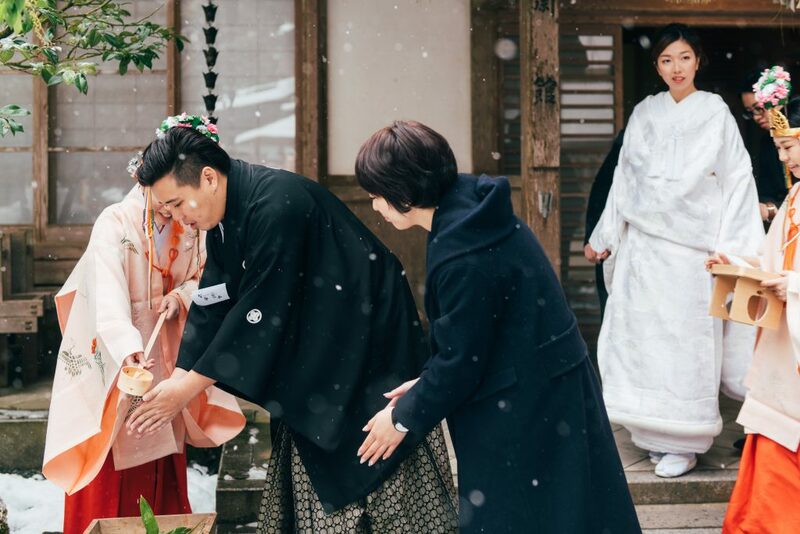 Couple and their guests having their hands cleansed. 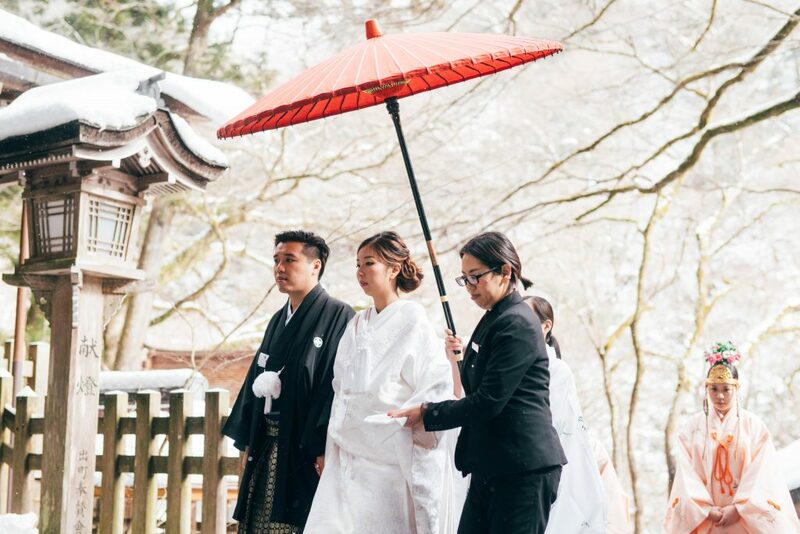 The beginning of the ceremony – and we were blessed by a brief snowfall, how lucky! 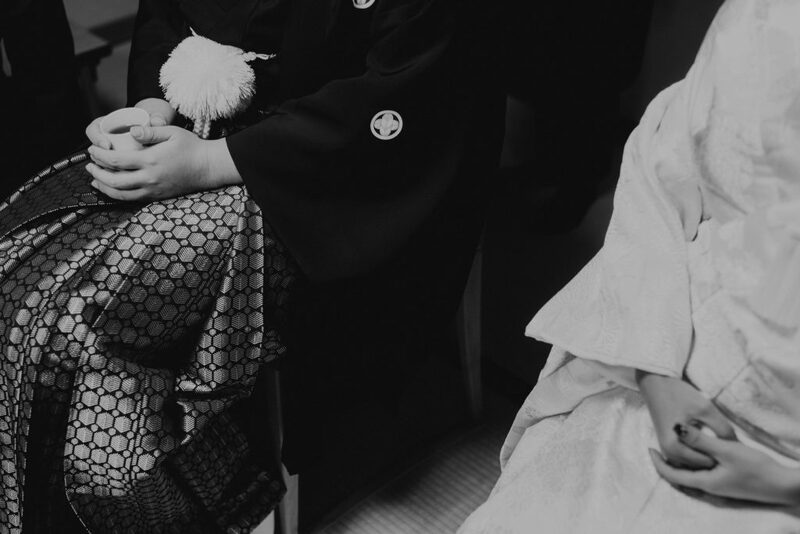 Again, many shrines may not allow phototaking within, where the ceremony takes place. Hence if this is a concern, do make sure to check with the venue beforehand. 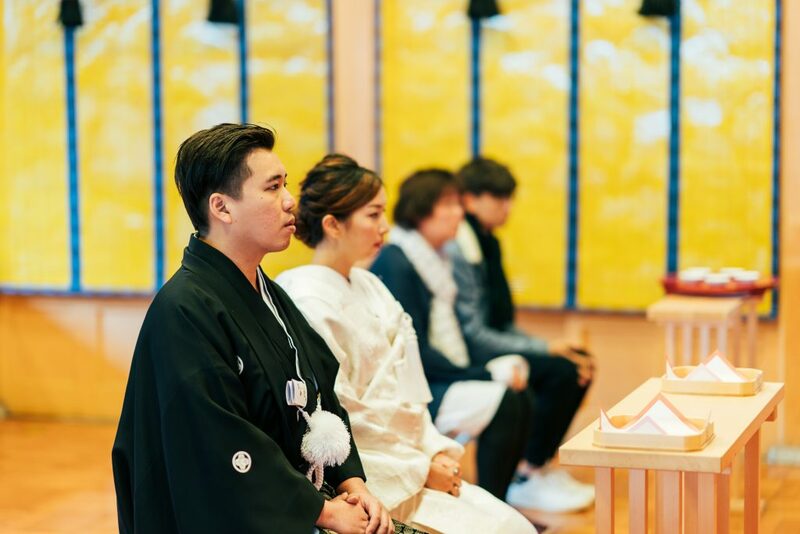 We’ll introduce the ceremony procedures in detail in another post. 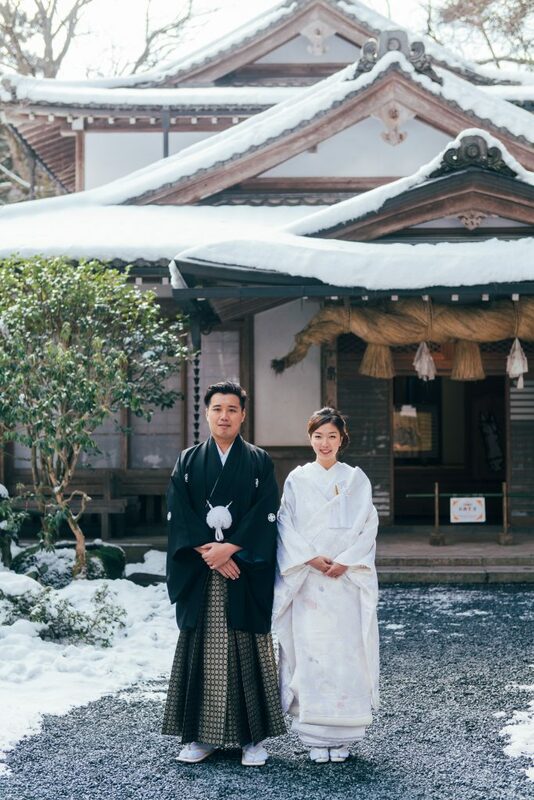 In the meantime, enjoy the rest of the photos from this set of snow wedding! 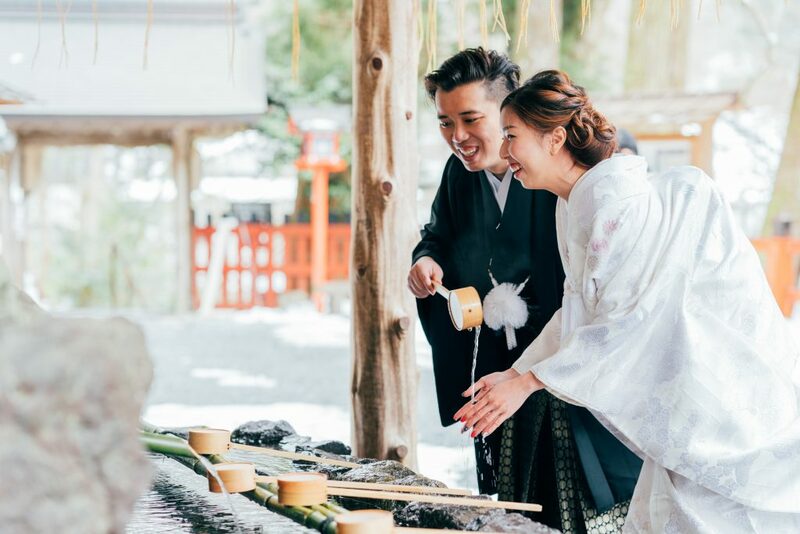 Traditional Japanese wedding ceremonies are usually more formal and solemn, which explains why couples are always really tensed before the ceremony. 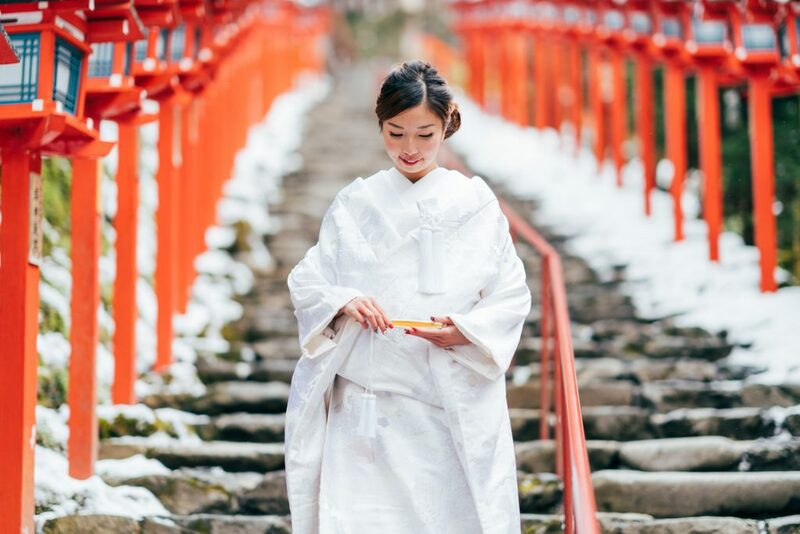 We’d recommend to try the fortune slips (Omukiji) at Kifune jinja. 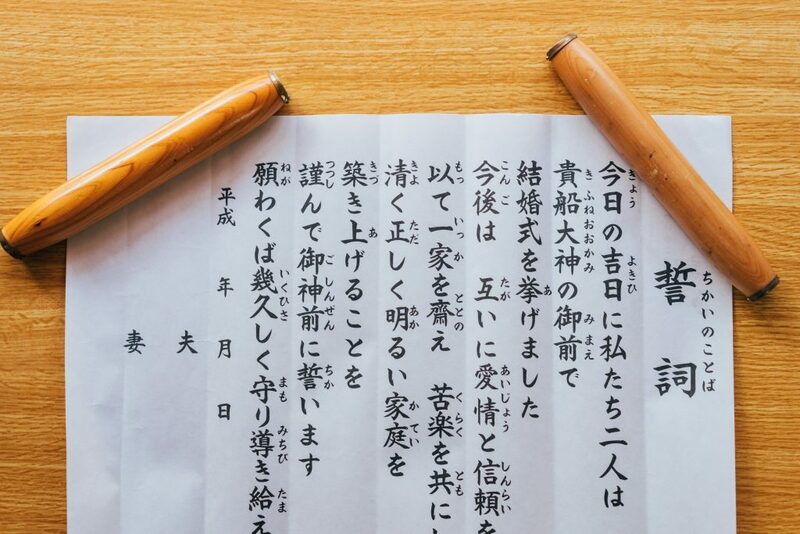 You are supposed to dip the fortune slips into water and the words on the will magically appear! 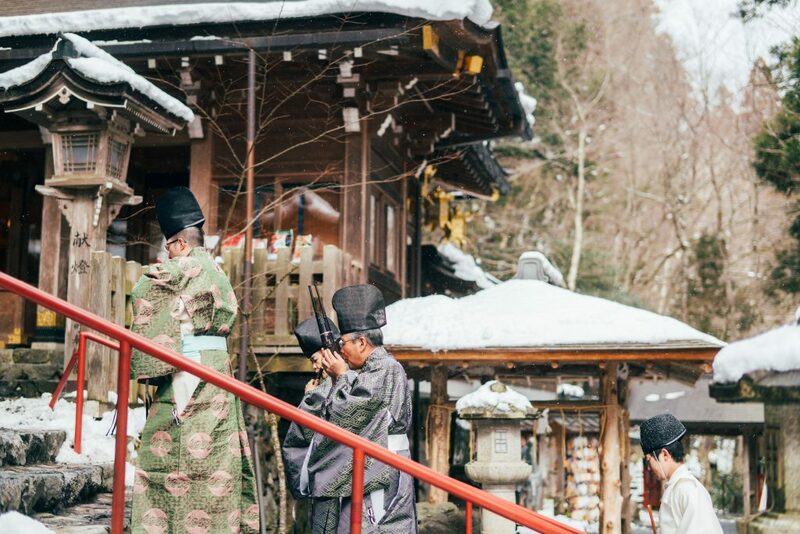 Kifune Jinja is believed to be guarded by the water gods, keeping the town safe from floods/landslides. 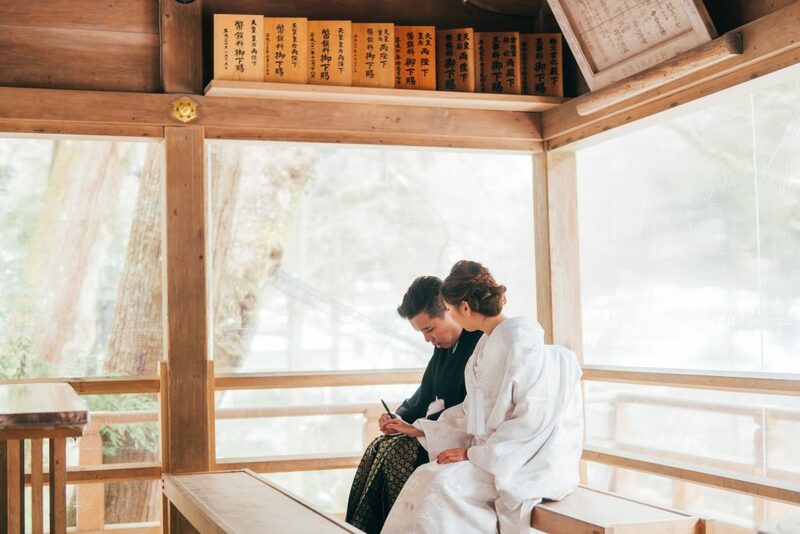 The slips at Kifune even come with a QR code which you can scan to obtain the English translation of your fortune slip. 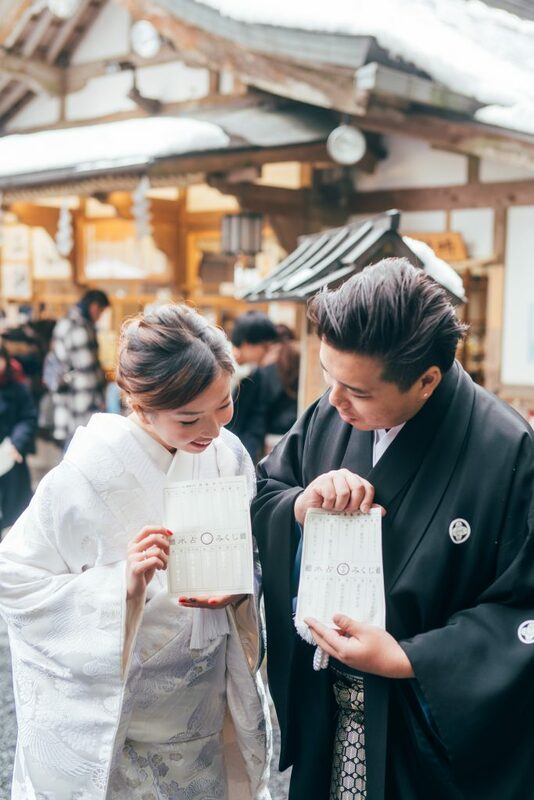 Not forgetting to write their wishes on the Emma, which are wooden plaques for you to write your prayers and hang them up at the Shrine for the gods to receive. 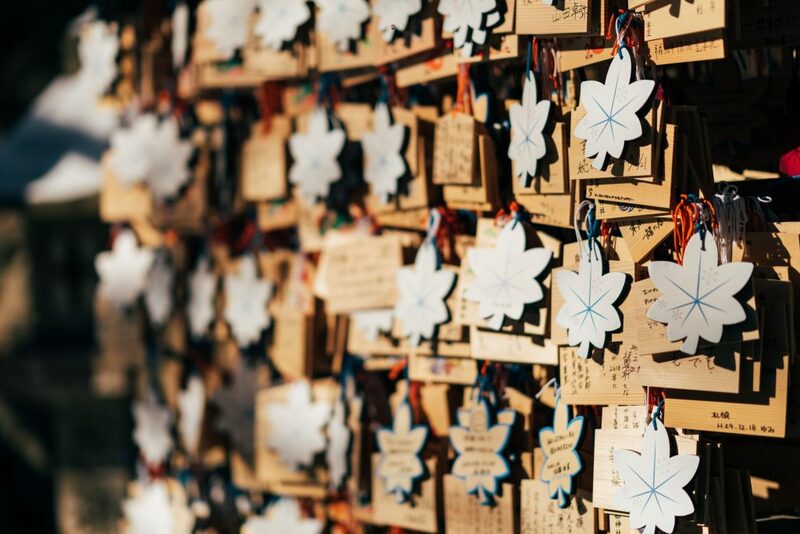 Don’t forget to come back to the Shrine to give thanks when your wishes come true! 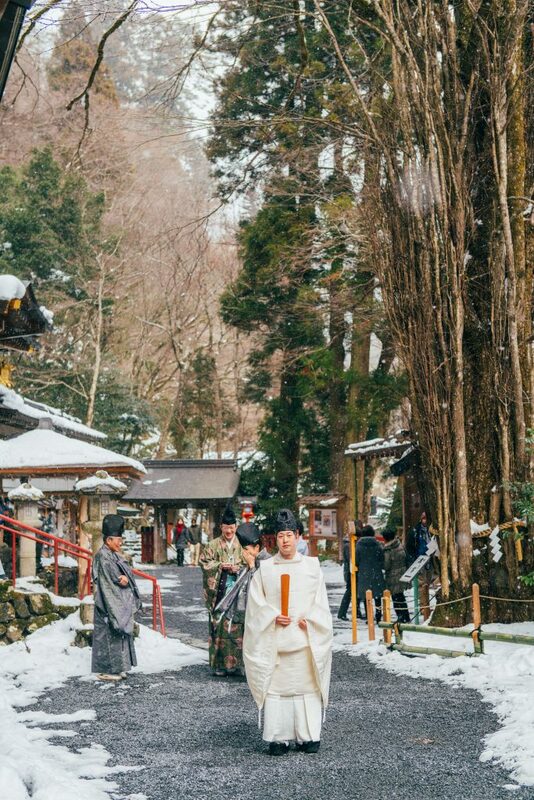 Had a little more time before our transport came to pick everyone back to their hotel, and continued to take some photos around the small town. Credits to Alwin from wearetrouve for the lovingly taken images. 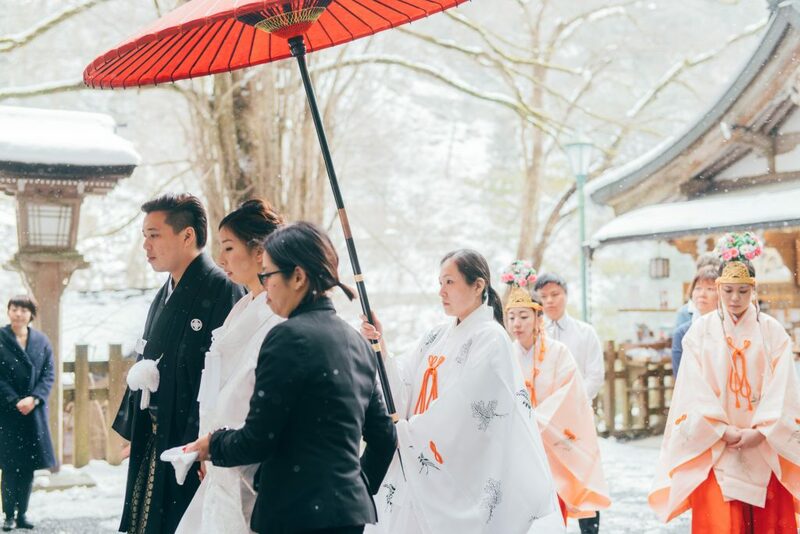 We were so glad to have fulfilled the bride’s dreamed snow wedding and to see the bride so happy after the entire ceremony. 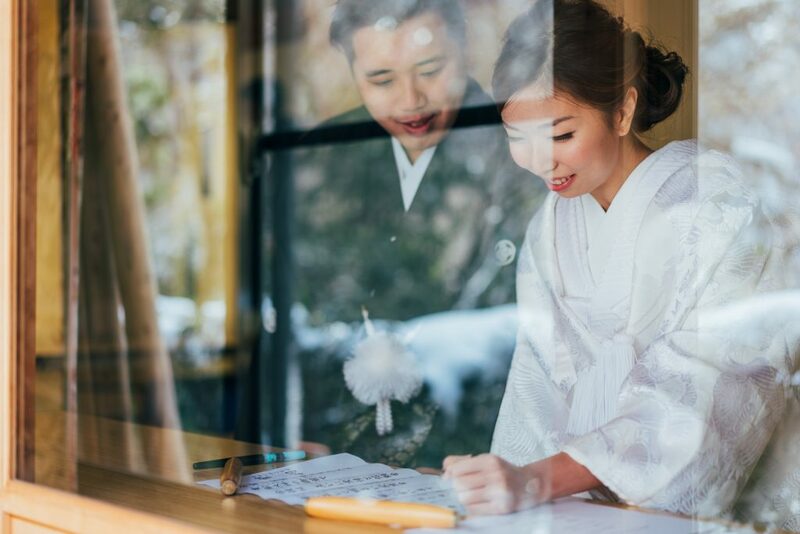 If you are considering to hold your destination wedd and need help with your wedding planning in Japan, feel free to visit our main site or reach out directly to us here. 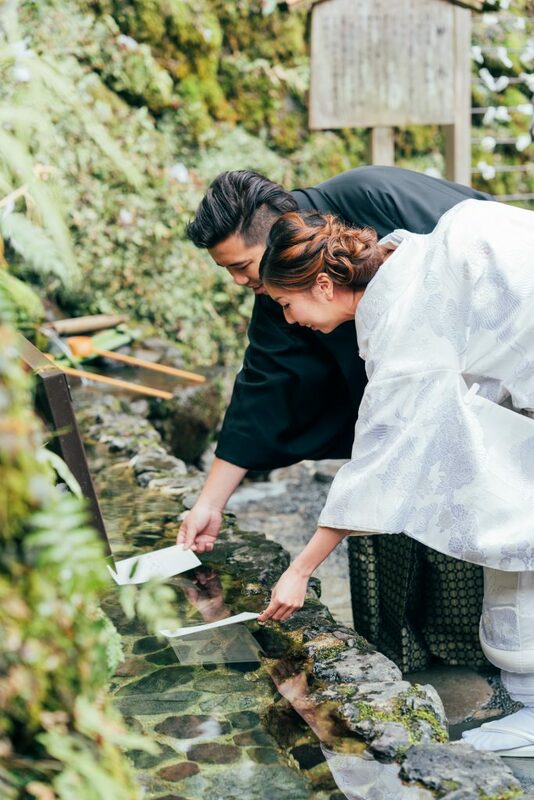 We do not have fixed wedding packages or plans, or day schedule as everything is customized, sourced and planned for according to each couple’s preferences for that unique experience. 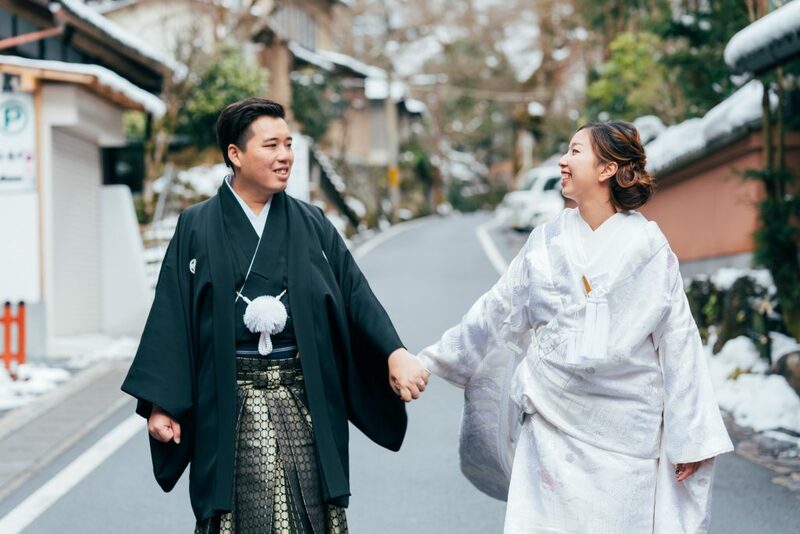 So ask us anything about Japan weddings and we will be glad to answer to you.